Contact our friendly customer care operators for a free and non-binding price offer for exterior and interior window cleaning today. Dial 020 3746 1366 or fill up the contact form - we will be quickly back to you. We only hire well-trained roof cleaners who can certainly deliver high quality house roof cleaning. Jet washing equipment is put to use to remove mold, algae, lichen, unsightly stains and any moss from roofs. Your roof has to be properly cleaned out on a frequently, so that your residence looks great, and so that no damage will occur due to debris and all the other detrimental clumps on it. The issue with microorganisms that dwell on your roof is that they can “eat off” the roof if left unattended for long. Our firm provides a efficient and inexpensive roof cleaning service, which will save you the difficulties of having to go up on your roof or on a ladder to carry out the cleaning your self. Be safe, and get our wholly insured cleaning service right now. Proper gutter cleaning is important if you want to keep your gutters and downpipes unclogged, and protect your property from water damage. Our expert gutter cleaners will use advanced tools to ensure that all leaves, twigs, dirt and other debris are removed properly. A powerful dry or water vacuum cleaner is used. It has telescopic poles with tiny cameras, so that the cleaners can see any debris and remove it. Ashlee House Cleaning offers a month quality guarantee. If your gutters get clogged within 30 days of the cleaning, we will send a cleaning team to unclog and clean them again for free! Thewindow cleaning service is deep cleaning of windows, using purified squeegee for internal window cleaning method and water and fed pole cleaning for external window cleaning. 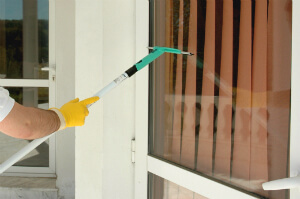 The deep and thorough Mile End E3 domestic window cleaning service involves not only secured window cleaning, but also cleaning of almost all frames, if PVC, wiping of all sills, if reachable, also. We guarantee fast result and insurance in case of any omission. Key pick-up and delivery can be planned, for those who have no chance to remain in the house throughout the process. Almost all type of domestic properties are accepted. We have a highly effective system for service appointments. Our customer support reps are available 24/7 to process your requests. Simply call 020 3746 1366 or send us an booking form. In the following 2 hours you will receive an e mail verification for your reservation. Our expert window cleaners will clean up not having any ladders and without stalking into your home windows if you are up to the Fourth floor. Our services come at fair rates, with no hidden fees. Book more than One service and you will spend less both time and money. There are special offers for those who book early on, for our frequent clients, as well as for regional property firms and landlords. So, if you want your windows perfectly cleaned - schedule our window cleaning Mile End E3 service at this moment!